Barbecued Ribs and “Throwed Rolls”? Please let me share with you where I just ate. Have you been here before and have you had their smoked barbecue ribs? Recently travels took me south through the great state of Missouri, mother riding shotgun. Now, we were road hungry looking for something different and if it involved barbecue, all the better! Well, my mother remembered eating at a place near where we were that through the dinner rolls to ya. Huhhh, I said to her? Yes, they throw the dinner rolls to ya. Now this sounds like my kind of place! Without hesitation, I programmed the trip to Lambert’s into the GPS. I want to be up front and tell you that this isn’t an ad for Lamberts. We just respect a good Barbecue and have to write about it when we taste it and they certainly earned the right to be in the spot light. So here ya go! On arrival and first seeing this popular eatery, I have to question the use of the word Cafe, since this place is more like the size of a sports arena. Well the cafe actually was small when Earl and Agnes Lambert opened it back in 1913. Not today though. It’s incredibly large. 48,960 lbs. of white beans and 2,246, 400 dinner rolls were served to their customers last year alone.. Parking? No problem. Cars, Vans, handicap, SUV, motorcycles, campers, tractor trailers, you name it. I’m sure there’s a landing strip out back somewhere, right? 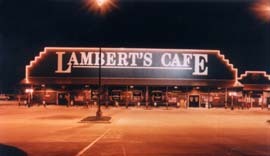 Now, you walk inside Lambert’s and its antiques and history at your finger tips. Look, I’d have to write a blog 5000 words long to do this establishment justice and even then, I would still have more to write about. Trust me, I’ve cooked at some incredible establishments and I can truly say, you won’t want to pass up this “Cafe”. A famous dining establishment where celebrities have frequented for years. Many celebrities have eaten here. James Arnes, Conway Twitty, Tammy Wynette, Dennis Weaver, Clint Eastwood and Elvis Presley to name a few. Elvis? You know…”Ya ain’t never caught a roll, than you ain’t no friend of mine”. Nothing short of a hungry guy and his mother’s dream when you sit down here. Even before we ordered, the food started flowing. Fried Okra spooned out onto brown paper napkins torn from the spool at our table. They call these “Pass Arounds” and these guys don’t mess around with Pass Arounds! It didn’t stop coming. Then before I could say more Iced Tea please, I saw dinner roll the size of a soft ball coming at a good clip at our table. I gathered all of my courage, reached out and made the catch. LOL. My mother, a little startled, let the first one pass her by as it landed on the fifty, mid table next to the sweet butter, but now well seasoned demonstrated her catching ability too and caught the second pass, one handed I might add. Made me feel confident to have her riding shot gun on this trip. If you haven’t figured it out by now. These guys are also known as the home of the Throwed Rolls. No miss print. Throwed! Yeah, I was thinking about my tread mill back home and looking at the salads on the menu. Me? Yeah right. Then I just put that out of my mind when the server offered us Apple Butter and Sorghum ladled out of a cooking pot table side to slather on the hot steamy incredible smelling dinner rolls. That put things back into perspective. Then mom and I just continued on with our careless disregard for healthy diet. Now let’s get down to the meat of this blog. 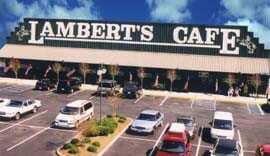 From me to you, arguably one of the best smoked, barbecued ribs in Missouri can be found at Lambert’s Cafe. Lambert’s serves competition style smoked Barbecue Ribs, hanging over the edge of a skillet. The real deal! Oh yeah, did I mention they toss a roll to ya when you get your ribs too? 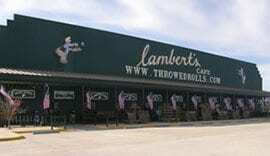 True, Lamber’s is known for southern cooking. Ribs there just happen to be some of the best I’ve ever had. A few more of their popular dishes are Pulled Pork Sandwich, Chicken and Dumplings (my mother had this and was in heaven! ), Chicken Fried Round Steak, Beef Liver and Onions, Barbecue Pork Steak, XXL – Center Cut Ham, Fried Catfish Filets. Sides? No problem. Southern comfort at its best! Baked Potato, Candied Yams, Cottage Cheese, Baby Carrots, Cole Slaw, Turnip Greens, Sliced Peaches, Corn, Baked Beans, White Beans, Green Beans, Sliced Beets, Fried Apples, Homemade Mashed Potatoes, Potato Salad, Cold Chunky Applesauce, Pineapple Walnut Salad, Cucumbers & Onions. What they call Pass Arounds… Fried Potatoes & Onions, Macaroni & Tomatoes, Black-Eyed Peas, Fried Okra, Hot Rolls & Sorghum. With the Barbecued Ribs, I had more of the fried Okra, Black-Eyed Peas and Candies Yams. Mom had the yams and famous mashed potatoes with the Chicken and Dumpling. We were drinking Iced Tea, in mugs that average about a quart of liquid. Don’t mean to imply anything, but seemed like my ribs were disappearing faster than I was actually eating them. Right Mom? LOL Can you blame her? These things were smoky falling off the bone barbecue heaven. The ribs are basted in Mr. Lamberts homemade barbecue sauce and smoked with natural hickory. So if you’re traveling from the west coast state of Washington to the east coast state of Maine, I would still recommend you go by way of Sikeston MO. Worth the detour.